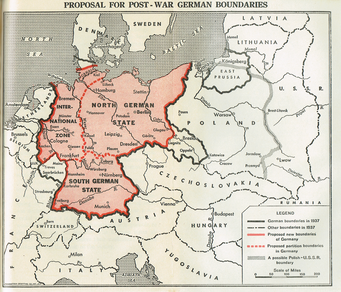 Morgenthau's proposal for the partition of Germany from his 1945 book Germany is Our Problem. The Morgenthau Plan (German: Morgenthau-Plan [ˈmɔɐ̯ɡn̩taʊ ˌplaːn]) by the Allied occupation of Germany following World War II was a proposal to eliminate Germany's ability to wage war by eliminating its arms industry, and the removal or destruction of other key industries basic to military strength. This included the removal or destruction of all industrial plants and equipment in the Ruhr. It was first proposed by United States Secretary of the Treasury Henry Morgenthau Jr. in a memorandum entitled Suggested Post-Surrender Program for Germany. While the Morgenthau Plan had some influence on Allied planning for the occupation of Germany, it was not adopted. US occupation policies aimed at "industrial disarmament", but contained a number of deliberate "loopholes", limiting any action to short-term military measures and preventing large-scale destruction of mines and industrial plants, giving wide-ranging discretion to the military governor and Morgenthau's opponents at the War Department. From 1947, US policies aimed at restoring a "stable and productive Germany" and were soon followed by the Marshall Plan. The Morgenthau Plan was seized upon by the Nazi German government, and used as part of propaganda efforts in the final months of the war which aimed to convince Germans to fight on. The original memorandum, written sometime between January and early September 1944, signed by Morgenthau, and headed "Suggested Post-Surrender Program for Germany" is preserved at the Franklin D. Roosevelt Presidential Library and Museum. According to Morgenthau's son, senior U.S. Treasury department official Harry Dexter White, was influential in drafting the memorandum. As indicated in part 3 an International zone should be created containing the Ruhr and the surrounding industrial areas. The area should be made an international zone to be governed by an international security organization to be established by the United Nations. In governing the area the international organization should be guided by policies designed to further the above stated objectives. At the Second Quebec Conference, a high-level military conference held in Quebec City, September 12–16, 1944, the British and United States governments, represented by Winston Churchill and Franklin D. Roosevelt, respectively, reached agreement on a number of matters, including a plan for Germany, based on Morgenthau's original proposal. The memorandum drafted by Churchill provided for "eliminating the warmaking industries in the Ruhr and the Saar... looking forward to converting Germany into a country primarily agricultural and pastoral in its character." However, it no longer included a plan to partition the country into several independent states. Secretary of the Treasury Henry J. Morgenthau Jr. persuaded Roosevelt to write to Secretary of State Cordell Hull and Secretary of War Henry L. Stimson saying that a US occupation policy which anticipated that "Germany is to be restored just as much as the Netherlands or Belgium" was excessively lenient. A better policy would have the Germans "fed three times a day with soup from Army soup kitchens" so "they will remember that experience the rest of their lives." Morgenthau was the only Cabinet member invited to participate in the Quebec Conference, during which the Plan was agreed. Roosevelt's motivations for agreeing to Morgenthau's proposal may be attributed to his desire to be on good terms with Joseph Stalin and to a personal conviction that Germany must be treated harshly. In an August 26, 1944 letter to Queen Wilhelmina of the Netherlands, Roosevelt wrote that "There are two schools of thought, those who would be altruistic in regard to the Germans, hoping by loving kindness to make them Christians again — and those who would adopt a much 'tougher' attitude. Most decidedly I belong to the latter school, for though I am not bloodthirsty, I want the Germans to know that this time at least they have definitely lost the war." Churchill was not inclined to support the proposal, saying "England would be chained to a dead body." Roosevelt reminded Churchill of Stalin's comments at the Tehran Conference, and asked "Are you going to let Germany produce modern metal furniture? The manufacture of metal furniture can be quickly turned in the manufacture of armament." The meeting broke up on Churchill's disagreement but Roosevelt suggested that Morgenthau and White continue to discuss with Lord Cherwell, Churchill's personal assistant. Some have read into the clause "from whom we had much to ask" that Churchill was bought off, and note a September 15 memo from Roosevelt to Hull stating that "Morgenthau has presented at Quebec, in conjunction with his plan for Germany, a proposal of credits to Britain totalling six and half billion dollars." Hull's comment on this was that "this might suggest to some the quid pro quo with which the Secretary of the Treasury was able to get Mr. Churchill's adherence to his cataclysmic plan for Germany". Anthony Eden expressed his strong opposition to the plan and, with the support of some others, was able to get the Morgenthau Plan set aside in Britain. In the United States, Hull argued that nothing would be left to Germany but land, and only 60% of the Germans could live off the land, meaning 40% of the population would die. Stimson expressed his opposition even more forcefully to Roosevelt. According to Stimson, the President said that he just wanted to help Britain get a share of the Ruhr and denied that he intended to fully deindustrialize Germany. Stimson replied, "Mr. President, I don't like you to dissemble to me" and read back to Roosevelt what he had signed. Struck by this, Roosevelt said he had "no idea how he could have initialed this". The theory that Roosevelt was not truly rejecting the plan is supported by Eleanor Roosevelt, who stated that she never heard him disagree with the basics of the plan, and who believed that "the repercussions brought about by the press stories made him feel that it was wise to abandon any final solution at that time", but other sources suggest that Roosevelt "had not realized the devastating nature of the program he had initialed". Journalist, Drew Pearson publicized the plan on 21 September 1944, although Pearson himself was sympathetic to it. More critical stories in the New York Times and The Wall Street Journal quickly followed. Joseph Goebbels used the Morgenthau Plan in his propaganda. Goebbels said that "The Jew Morgenthau" wanted to make Germany into a giant potato patch. The headline of the Völkischer Beobachter stated, "Roosevelt and Churchill Agree to Jewish Murder Plan!" The Washington Post urged a stop to helping Dr. Goebbels: if the Germans suspect that nothing but complete destruction lies ahead, then they will fight on. The Republican presidential candidate Thomas Dewey complained in his campaign that the Germans had been terrified by the plan into fanatical resistance, "Now they are fighting with the frenzy of despair." General George Marshall complained to Morgenthau that German resistance had strengthened. Hoping to get Morgenthau to relent on his plan for Germany, President Roosevelt's son-in-law Lt. Colonel John Boettiger who worked in the War Department explained to Morgenthau how the American troops who had had to fight for five weeks against fierce German resistance to capture the city of Aachen had complained to him that the Morgenthau Plan was "worth thirty divisions to the Germans." Morgenthau refused to relent. On 11 December 1944, OSS operative William Donovan sent Roosevelt a telegraph message from Bern, warning him of the consequences that the knowledge of the Morgenthau plan had had on German resistance. The message was a translation of a recent article in the Neue Zürcher Zeitung. In January 1946 the Allied Control Council set the foundation of the future German economy by putting a cap on German steel production; the maximum allowed was set at about 25% of the prewar production level. Steel plants thus made redundant were dismantled. Also as a consequence of the Potsdam conference, the occupation forces of all nations were obliged to ensure that German standards of living could not exceed the average level of European neighbors with which it had been at war, France in particular. Germany was to be reduced to the standard of life it had known in 1932. [need quotation to verify]. The first "level of industry" plan, signed in 1946, stated that German heavy industry was to be lowered to 50% of its 1938 levels by the closing of 1,500 manufacturing plants. The problems brought on by the execution of these types of policies were eventually apparent to most US officials in Germany. Germany had long been the industrial giant of Europe, and its poverty held back the general European recovery. The continued scarcity in Germany also led to considerable expenses for the occupying powers, which were obligated to try to make up the most important shortfalls through the GARIOA program (Government and Relief in Occupied Areas). In view of the continued poverty and famine in Europe, and with the onset of the Cold War which made it important not to lose all of Germany to the communists, it was apparent by 1947 that a change of policy was required. The change was heralded by Restatement of Policy on Germany, a famous speech by James F. Byrnes, then United States Secretary of State, held in Stuttgart on September 6, 1946. Also known as the "Speech of hope" it set the tone of future US policy as it repudiated the Morgenthau Plan economic policies and with its message of change to a policy of economic reconstruction gave the Germans hope for the future. Herbert Hoover's situation reports from 1947, and "A Report on Germany" also served to help change occupation policy. The Western powers' worst fear by now was that the poverty and hunger would drive the Germans to Communism. General Lucius Clay stated "There is no choice between being a communist on 1,500 calories a day and a believer in democracy on a thousand." After lobbying by the Joint Chiefs of Staff, and Generals Clay and Marshall, the Truman administration realized that economic recovery in Europe could not go forward without the reconstruction of the German industrial base on which it had previously been dependent. In July 1947, President Truman rescinded on "national security grounds" the punitive JCS 1067, which had directed the US forces of occupation in Germany to "take no steps looking toward the economic rehabilitation of Germany". It was replaced by JCS 1779, which instead stressed that "[a]n orderly, prosperous Europe requires the economic contributions of a stable and productive Germany". The most notable example of this change of policy was a plan established by US Secretary of State George Marshall, the "European Recovery Program", better known as the Marshall Plan, which in the form of loans instead of the free aid received by other recipients was extended to also include West Germany. A new document was drafted, the Joint Chiefs of Staff directive 1067 (JCS 1067). Here the US military government of occupation in Germany was ordered to "take no steps looking toward the economic rehabilitation of Germany [or] designed to maintain or strengthen the German economy" and it was also ordered that starvation, disease and civil unrest were to be kept below such levels where they would pose a danger to the troops of occupation. The directive was formally issued to Eisenhower in the spring of 1945, and it applied only to the US zone (although attempts had been made to get the other Allies to accept it). The occupation directive remained secret until October 17, 1945. It was made known to the public two months after the US had succeeded in incorporating much of it into the Potsdam Agreement. On May 10, 1945, Truman signed JCS 1067. Ignoring the amendments to JCS 1067 that had been inserted by McCloy of the War Department, Morgenthau told his staff that it was a big day for the Treasury, and that he hoped that "someone doesn't recognize it as the Morgenthau Plan". In occupied Germany Morgenthau left a direct legacy through what in OMGUS commonly were called "Morgenthau boys". These were US Treasury officials whom Dwight D. Eisenhower had "loaned" to the Army of occupation. These people ensured that the JCS 1067 was interpreted as strictly as possible. They were most active in the first crucial months of the occupation, but continued their activities for almost two years following the resignation of Morgenthau in mid-1945 and some time later also of their leader Colonel Bernard Bernstein, who was "the repository of the Morgenthau spirit in the army of occupation". Morgenthau had been able to wield considerable influence over Joint Chiefs of Staff Directive 1067. JCS 1067 was a basis for US occupation policy until July 1947, and like the Morgenthau Plan, was intended to reduce German living standards. The production of oil, rubber, merchant ships, and aircraft were prohibited. Occupation forces were not to assist with economic development apart from the agricultural sector. In his 1950 book Decision in Germany, Clay wrote, "It seemed obvious to us even then that Germany would starve unless it could produce for export and that immediate steps would have to be taken to revive industrial production." Lewis Douglas, chief adviser to General Lucius Clay, US High Commissioner, denounced JCS Directive 1067 saying, "This thing was assembled by economic idiots. It makes no sense to forbid the most skilled workers in Europe from producing as much as they can in a continent that is desperately short of everything." Douglas went to Washington in the hopes of having the directive revised but was unable to do so. In view of increased concerns by General Lucius D. Clay and the Joint Chiefs of Staff over communist influence in Germany, as well as of the failure of the rest of the European economy to recover without the German industrial base on which it was dependent, in the summer of 1947, Secretary of State George Marshall, citing "national security grounds", was able to convince President Harry S. Truman to remove JCS 1067, and replace it with JCS 1779. JCS 1067 had then been in effect for over two years. In October 1945 Harper and Brother published Morgenthau's book Germany is Our Problem, where Morgenthau described his plan and the rationale for it in greater detail. President Franklin D. Roosevelt had granted permission for the publication of the book the evening before his death, when dining with Morgenthau at Warm Springs. In November 1945 General Dwight D. Eisenhower, the Military Governor of the US Occupation Zone, approved the distribution of 1000 free copies of the book to American military officials in occupied Germany. Historian Stephen Ambrose draws the conclusion that, despite Eisenhower's later claims that the act was not an endorsement of the Morgenthau plan, Eisenhower both approved of the plan and had previously given Morgenthau at least some of his ideas on how Germany should be treated. A review in the New York Times on October 7, 1945 felt that the book was important to the survival of the American people and would help prevent World War III. A review by Orville Prescott on October 5, 1945 in the same newspaper concluded that the whole world would benefit if copies of the book reached the key US decisionmakers responsible for policy about Germany. Some progress has been made in converting Germany to an agricultural and light industry economy, said Brigadier General William H. Draper, Jr., chief of the American Economics Division, who emphasized that there was general agreement on that plan. By February 28, 1947, it was estimated that 4,160,000 German former prisoners of war, by General Dwight D. Eisenhower relabeled as Disarmed Enemy Forces in order to negate the Geneva Convention, were used as forced labor by the various Allied countries to work in camps outside Germany: 3,000,000 in Russia, 750,000 in France, 400,000 in Britain and 10,000 in Belgium. Meanwhile, in Germany large parts of the population were starving at a time when according to a study done by former US President Herbert Hoover the nutritional condition in countries that in Western Europe was nearly pre-war normal. German prisoners engaged in dangerous tasks, such as clearing mine fields. The Saar Protectorate, another important source of coal and industry for Germany, was likewise to be lost by the Germans. It was cut out from Germany and its resources put under French control. In 1955, the French, under pressure from West Germany and her newfound allies, held a plebiscite in the Saar Protectorate on the question of reunification or independence. Reunification won overwhelmingly, and on January 1, 1957, it rejoined West Germany as the state of Saarland. As Germany was allowed neither airplane production nor any shipbuilding capacity to supply a merchant navy, all facilities of this type were destroyed over a period of several years. A typical example of this activity by the allies was the Blohm & Voss shipyard in Hamburg, where explosive demolition was still taking place as late as 1949. Everything that could not be dismantled was blown up or otherwise destroyed. A small-scale attempt to revive the company in 1948 ended with the owners and a number of employees being thrown in jail by the British. It was not until 1953 that the situation gradually started to improve for the Blohm & Voss, thanks in part to repeated pleas by German Chancellor Konrad Adenauer to the Allied High Commissioners. Over a period of years, American policy slowly changed away from this policy of "industrial disarmament". The first and main turning point was the speech "Restatement of Policy on Germany" held in Stuttgart by the United States Secretary of State James F. Byrnes on September 6, 1946. Reports such as this by former US President Herbert Hoover, dated March 1947, also argued for a change of policy, among other things through speaking frankly of the expected consequences. In July 1947, President Harry S. Truman rescinded on "national security grounds" JCS 1067, which had directed the US forces of occupation in Germany to "take no steps looking toward the economic rehabilitation of Germany". In addition to the physical barriers that had to be overcome, for the German economic recovery there were also intellectual challenges. The Allies confiscated intellectual property of great value, all German patents both in Germany and abroad, and used them to strengthen their own industrial competitiveness by licensing them to Allied companies. Beginning immediately after the German surrender and continuing for the next two years, the US pursued a vigorous program to harvest all technological and scientific know-how as well as all patents in Germany. John Gimbel comes to the conclusion, in his book Science Technology and Reparations: Exploitation and Plunder in Postwar Germany, that the "intellectual reparations" taken by the US and the UK amounted to close to $10 billion. During the more than two years that this policy was in place, no industrial research in Germany could take place[citation needed] without any results being automatically available to overseas competitors who were encouraged by the occupation authorities to access all records and facilities. Meanwhile, thousands of the best German researchers were being put to work in the Soviet Union and in the UK and US (see also Operation Paperclip). The Marshall Plan was extended to also include Western Germany after it was realized that the suppression of the Western German economy was holding back the recovery of the rest of Europe. In 1953 it was decided that Germany was to repay $1.1 billion of the aid it had received. The last repayment was made in June 1971. In a largely symbolic 2004 resolution by the lower house of the Polish Parliament reparations of $640 billion were demanded from Germany, mainly as a weapon in an ongoing argument regarding German property claims on formerly German territory. However, at the Potsdam conference the Soviet Union undertook to settle the reparation claims of Poland from its own share of reparations from Germany. In 1953 Poland agreed to forego further reparations claims against Germany. Meanwhile, Poland was now in possession of almost a quarter of pre-war German territory, including the important industrial centers in Silesia and the richest coal fields in Europe. In addition, many ethnic Germans living within the Polish pre-war borders were prior to their expulsion for years used as forced labor in camps such as the camp run by Salomon Morel, for example, Central Labour Camp Jaworzno, Central Labour Camp Potulice, Łambinowice, Zgoda labour camp and others. In 1949 West German Chancellor Konrad Adenauer wrote to the Allies requesting that the policy of industrial dismantling end, citing the inherent contradiction between encouraging industrial growth and removing factories and also the unpopularity of the policy. The US diplomat James Dobbins writes that an early draft of JCS 1067 had been written while the plan was still understood to be US policy, and "[b]ecause nothing replaced the Morgenthau plan once it had been disavowed, the final version of JCS 1067 contained many of the harsh measures and all the intent of a hard peace toward Germany". However, according to Dobbins, in May 1945 – shortly after its approval in April 1945 – the newly appointed deputy military governor, General Clay, implied that the directive was unworkable and initially wanted it to be revised; after the deliberate loopholes were pointed out to him, General Clay did not press further for a revision but "took great liberties in interpreting and implementing JCS 1067". Clay's good-willed effort did meet obstacles, like General Marshall forbidding him from relaxing the strict non-fraternization to a more reasonable level. Dobbins remarks that the harsh punitive measures shifted toward reform over time as the US faced with the problem of feeding millions of Germans and the Soviet expansion. Gerhard Schulz [de] mentions that the American military government was, until 1947, operating under JCS 1067, which he describes as "a framework that had its origin in the Morgenthau Plan". The German Federal Agency for Civic Education (BPD) asserts that the Morgenthau Plan was never implemented and was only briefly supported by Roosevelt, and that JSC 1067, while treating Germany as a defeated enemy state instead of a liberated nation and aiming at the dismantling of German industries, also left loopholes that allowed a military governor to later implement more lenient policies. The agency states that the purpose of JCS 1779, which replaced JCS 1067, was to increase German self-government at the regional level, limit dismantling of war industries, raise living standards, and remove dependence on subsidies. German historian Bernd Greiner [de] talks of the failure of Morgenthau and the backward-looking political minority that supported him, stating that by the end of 1945 Morgenthau's staff had returned to the USA despondent, and those then in charge were not interested in "industrial disarmament". However, according to Greiner, the "Morgenthau myth" (German: die Morgenthau-Legende) was perpetuated in West Germany by right-wing extremist historians echoing Nazi propaganda and railing against an "extermination plan" for Germany by Jews and the left-wing intelligensia in America, while in Communist East Germany the Morgenthau Plan was presented as a western imperialist plot to destroy Germany. Wolfgang Benz, director of the Center for Research on Antisemitism at the Technical University of Berlin, states that the plan had no significance for the later occupation and Germany policy, though Nazi propaganda on the subject had a lasting effect and is still used for propaganda purposes by extreme right-wing organizations. Benz also states that Morgenthau had romantic agrarianist ideals which might mean that the intentions of his plan could have been beyond preventing conflicts. German historian Rainer Gömmel criticises the common claim by historians, including Benz, that the Morgenthau Plan was never implemented, arguing that core elements of the plan, namely the proposals for deindustrialisation, were adopted in August 1945 and became part of Allied policy. The Norwegian economist Erik S. Reinert, states that "The Morgenthau Plan was abruptly stopped in Germany in 1947", compares United States policies toward third-world countries at the end of the 20th century with the Morgenthau Plan (in the wider sense), arguing that they have the de facto effect of de-industrializing third-world nations; he contrasts such destructive "Morgenthau plans" with more beneficial "Marshall plans". Monnet Plan, a 1945–1947 reconstruction plan for France that proposed giving France control over the German coal and steel areas of the Ruhr and the Saar. ^ a b The text, and a facsimile image, can be viewed online. Morgenthau, Henry (1944). "Suggested Post-Surrender Program for Germany [The original memorandum from 1944, signed by Morgenthau] (text and facsimile)". Box 31, Folder Germany: Jan.-Sept. 1944 (i297). Franklin D. Roosevelt Presidential Library and Museum (published 27 May 2004). Archived from the original on 31 May 2013. Demilitarization of Germany: It should be the aim of the Allied Forces to accomplish the complete demilitarization of Germany in the shortest possible period of time after surrender. This means completely disarming the German Army and people (including the removal or destruction of all war material), the total destruction of the whole German armament industry, and the removal or destruction of other key industries which are basic to military strength. ^ Gareau 1961, p. 520. ^ Greiner 1995, pp. 199–204. ^ Greiner 1995, pp. 327–328. ^ Dietrich 2002, p. 17ff. ^ a b Gareau 1961, p. 517. ^ Hull 1948, pp. 1602–3. ^ Blum 1967, p. 373. ^ Hull 1948, pp. 1613–4. ^ "Investigations: One Man's Greed". TIME.com. 23 November 1953. Retrieved 28 September 2014. ^ Hull 1948, p. 1617. ^ a b Gareau 1961, p. 530. ^ Wend, Henry Burke (2001). Recovery and Restoration: U.S. Foreign Policy and the Politics of Reconstruction of West Germany's Shipbuilding Industry, 1945-1955. Greenwood Publishing Group. p. 26. ISBN 9780275969905. ^ Sutcliffe, Anthony (2014). An Economic and Social History of Western Europe Since 1945. Routledge. p. 57. ISBN 9781317892199. ^ Council for Social and Economic Studies (U.S.), George Mason University. Contemporary Economics and Business Association (2000). The Journal of Social, Political and Economic Studies. Contemporary Economics and Business Association at George Mason University and Council for Social and Economic Studies. p. 123. ^ Axelrod, Alan (2009). The Real History of the Cold War: A New Look at the Past. Sterling Publishing Company, Inc. p. 217. ISBN 9781402763021. ^ Hillenbrand, Martin Joseph (1998). Fragments of Our Time: Memoirs of a Diplomat. University of Georgia Press. p. 222. ISBN 9780820320168. ^ "Cornerstone of Steel". TIME.com. 21 January 1946. Retrieved 28 September 2014. ^ "Cost of Defeat". TIME.com. 8 April 1946. Retrieved 28 September 2014. ^ Henry C. Wallich. Mainsprings of the German Revival (1955) p. 348. ^ Bickerton, Ian (2011). The Illusion Of Victory: The True Costs of Modern War. Melbourne University Publishing. p. 173. ISBN 9780522860238. ^ Society for the Prevention of World War III (New York, N.Y.) (1949). Prevent World War III., Issues 30-52. Society for Prevention of World War III. p. 9. ^ a b c d "Pas de Pagaille!". TIME.com. 28 July 1947. Retrieved 28 September 2014. ^ Petrov 1967, pp. 228–29. ^ Petrov 1967, p. 18. ^ a b Petrov 1967, p. 237. ^ "Draft, The President's Economic Mission to Germany and Austria, Report 3, March, 1947; OF 950B: Economic Mission as to Food..." Retrieved 28 September 2014. ^ Gareau 1961, p. 526. ^ Press-Barnathan, Galia (Oct 24, 2014). The Political Economy of Transitions to Peace. University of Pittsburgh Pre. ISBN 9780822973584. ^ Dobbins, James; Poole, Michele A.; Long, Austin; Runkle, Benjamin (2008). After the War: Nation-Building from FDR to George W. Bush. Rand Corporation. p. 21. ISBN 9780833045560. While they had been successful in excluding Morgenthau, Hilldring's staff at the Civil Affairs Division had begun an early draft of what would become [JCS 1067] ... They had written the draft while the Morgenthau Plan was understood to be U.S. Policy ... Because nothing replaced the Morgenthau plan once it had been disavowed, the final version of JCS 1067 contained many of the harsh measures and all the intent of a hard peace toward Germany. ^ Dobbins, James; Poole, Michele A.; Long, Austin; Runkle, Benjamin (2008). After the War: Nation-Building from FDR to George W. Bush. Rand Corporation. pp. 11, 23, 24, 30, 31. ISBN 9780833045560. When Lieutenant General Lucius Clay arrived in Europe in May 1945 as the newly appointed deputy military governor, he had not yet seen JCS 1067. After he read it, he told Hilldring that 'Washington apparently did not have [a] clear idea of what conditions were like in Germany and asked to have the directive revised to make it "flexible and general". Hilldring responded that it was better to have something than nothing and that it had been carefully drafted by Stimpson and his deputy McCloy to include loopholes. ^ Schulz, Gerhard (2004). Geschichte im Zeitalter der Globalisierung. Walter de Gruyter. p. 128. ISBN 9783110204766. ^ Kotowski, Georg (1990). "Berlin im Spannungsfeld zwischen West und Ost" [Berlin between the opposing poles of West and East]. In Ribbe, Wolfgang; Schmädeke, Jürgen. Berlin in Modern Europe: Conference Proceedings [Berlin im Europa der Neuzeit: ein Tagungsbericht]. de Gruyter. p. 449. ISBN 9783110116632. Soweit ich deren Ergebnisse kenne, scheint mir festzustehen, dass in Washington zwar schon 1941 Pläne für eine Deutschlandpolitik nach dem Krieg entwickelt wurden, jedoch kein vom Präsidenten angenommenes Konzept entstand, das als Grundlage einer zielgerichteten Politik hätte dienen können. Dies bewirkte eine Zurückstellung der deutschen Frage bis nach dem totalen Endsieg über die Achsenmächte und Japan. Allenfalls könnte man in der zeitweiligen Billigung des Morgenthau-Planes durch Roosevelt eine Leitlinie seiner Deutschland-Politik erkennen, zumal dieser Plan auf wichtigen Teilgebieten in die Direktive JCS 1067 der Vereinigten Stabchefs der amerikanischen Streitkräfte einging. ^ Wend, Henry Burke (2001). Recovery and Restoration: U.S. Foreign Policy and the Politics of Reconstruction of West Germany's Shipbuilding Industry, 1945–1955. Greenwood Publishing Group. p. 27. ISBN 978-0-275-96990-5. ^ Wend, Henry Burke (2001). Recovery and Restoration: U.S. Foreign Policy and the Politics of Reconstruction of West Germany's Shipbuilding Industry, 1945–1955. Greenwood Publishing Group. p. 42. ISBN 978-0-275-96990-5. ^ Wend, Henry Burke (2001). Recovery and Restoration: U.S. Foreign Policy and the Politics of Reconstruction of West Germany's Shipbuilding Industry, 1945–1955. Greenwood Publishing Group. pp. 12, 27–28. ISBN 978-0-275-96990-5. ^ Hudson, Walter M. (2015). Army Diplomacy: American Military Occupation and Foreign Policy After World War II. University Press of Kentucky. p. 172. ISBN 9780813160993. JCS 1067 contained its share of weighty pronouncements. Germany was to be treated as a 'defeated enemy nation', and it needed to be 'brought home to the Germans that Germany's ruthless warfare and the fanatical Nazi resistance have destroyed the German economy and made chaos and suffering inevitable', language that could be read as foreshadowing a Morgenthau Plan–like occupation. But such language was in large part rhetorical. According to McCloy, JCS 1067 deliberately deflected the Morgenthau Plan's more punitive measures. ... The overall language of JCS 1067 was sufficiently broad that Clay did not find JCS 1067 particularly restrictive. ^ Germany's Federal Agency for Civic Education. "15./17. Juli 1947". bpb.de. Retrieved 2 October 2016. ^ Greiner 1995, pp. 12–13. ^ Greiner 1995, pp. 19–22. ^ Reinert, Erik S (20 June 2003). "Increasing Poverty in a Globalized World: Marshall Plans and Morgenthau Plans as Mechanisms of Polarization of World Incomes". In Chang, Ha-Joon. Rethinking Development Economics. Anthem Press. p. 455. ISBN 978-0-85728-753-3. Dietrich, John (2002). The Morgenthau Plan: Soviet Influence on American Postwar Policy. Algora. ISBN 9781892941909. Casey, Steven (2005). "The campaign to sell a harsh peace for Germany to the American public, 1944–1948". History. 90 (297): 62–92. doi:10.1111/j.1468-229x.2005.00323.x. ISSN 1468-229X. .
Morgenthau, Henry (1944). "Suggested Post-Surrender Program for Germany [The original memorandum from 1944, signed by Morgenthau] (text and facsimile)". Box 31, Folder Germany: Jan.-Sept. 1944 (i297). Franklin D. Roosevelt Presidential Library and Museum (published 27 May 2004). Archived from the original on 31 May 2013. Gunther Harkort Representative of the Federal Republic of Germany to the Economic Cooperation Administration (ECA), 1949–52.